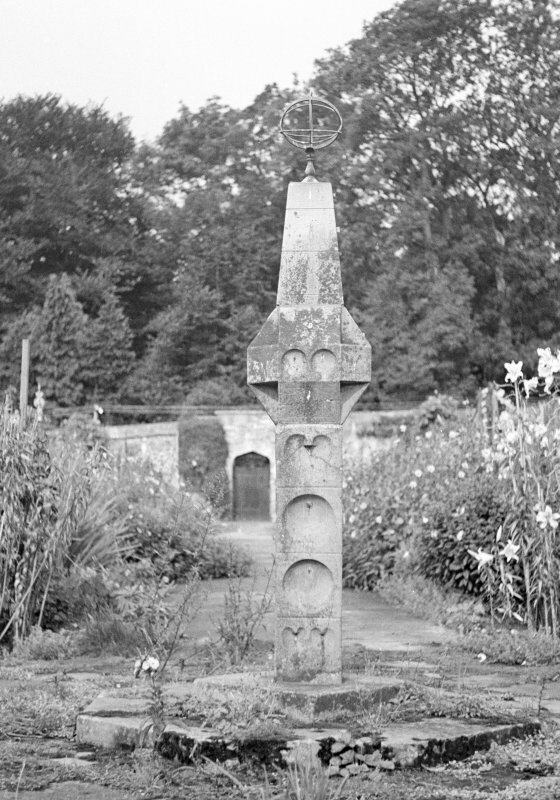 Detail of sundial, Ardlamont House, showing decoration on north side. 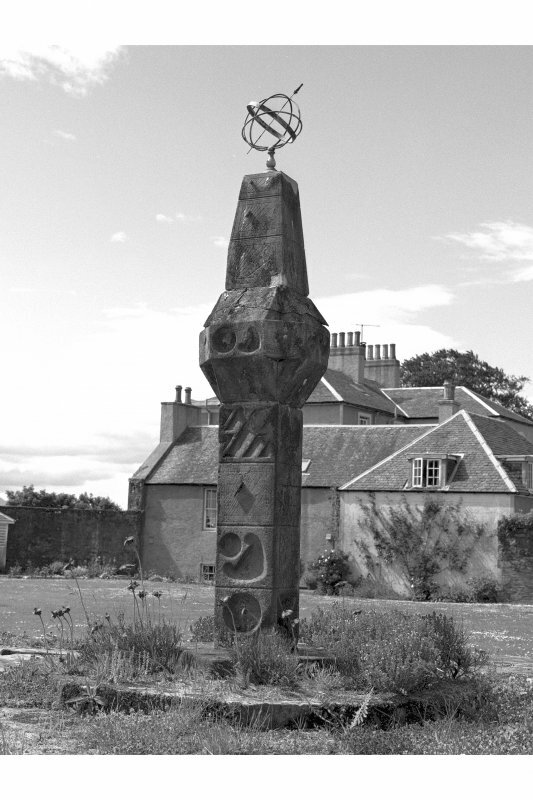 Ardlamont House, Sundial. View from South. 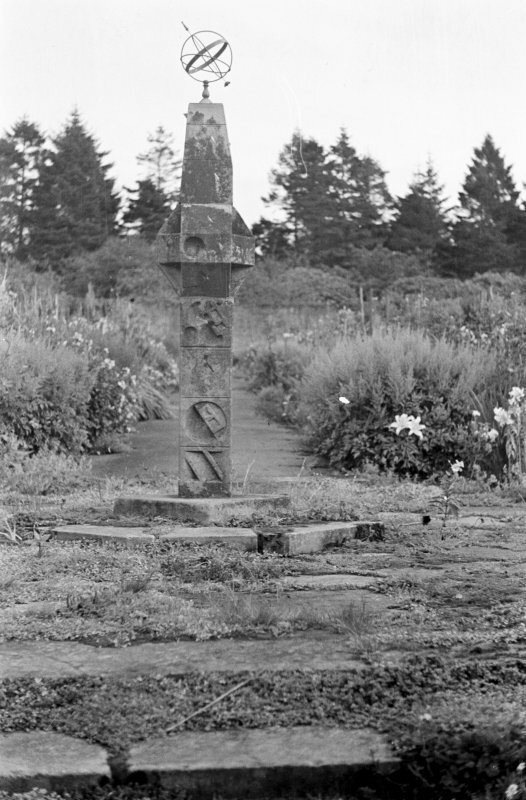 Ardlamont House, Sundial. Detail of North side showing decoration. 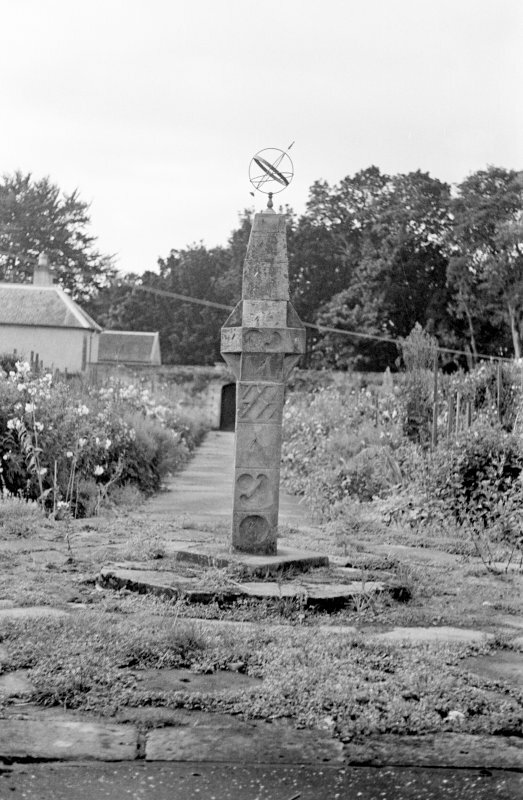 There is a well-preserved obelisk sundial in the garden of Ardlamont House. Visited by OS 25 October 1972. SUNDIAL. 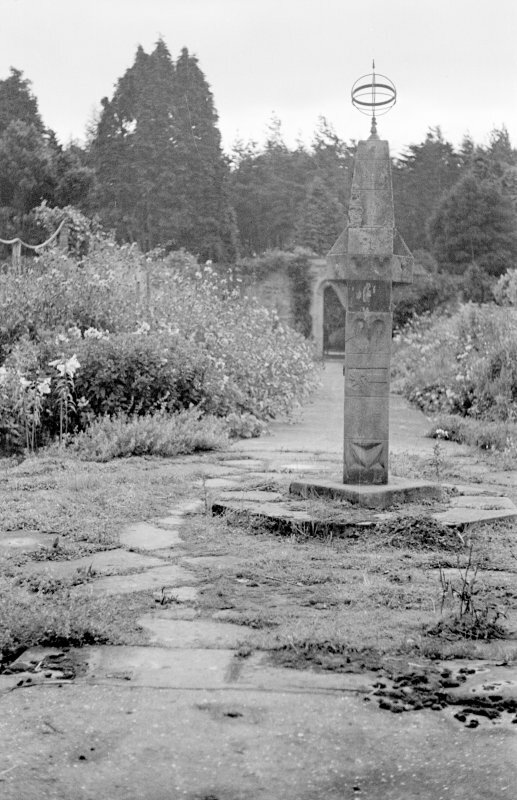 At the centre of the garden, which is enclosed by a wall 3m high, there is an obelisk sundial measuring 1.74m in overall height. It is in three sections, the shaft being of red sandstone, and the faceted octagon and obelisk being of grey sandstone all much shattered and repaired. 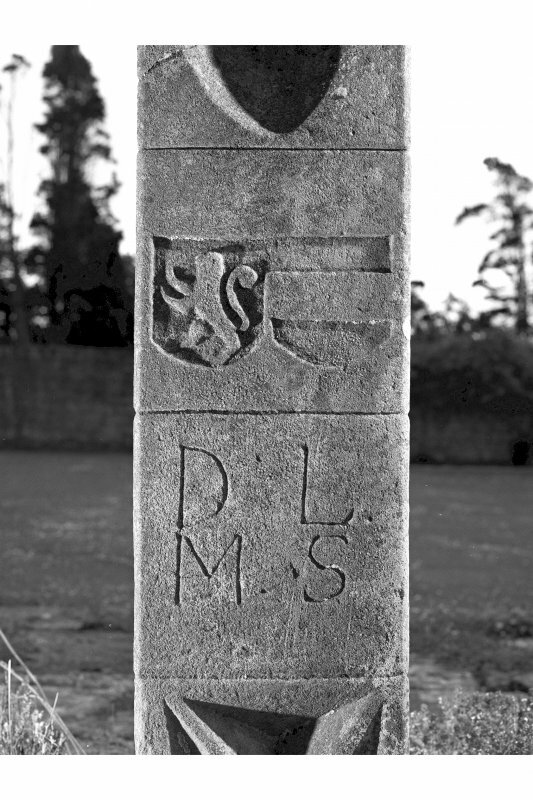 The shaft is 0.85m high by 0.23m square and is divided into four rather than the usual five panels (cf. Nos.l53, 285,286), with sunken circles, hearts and a chevron. 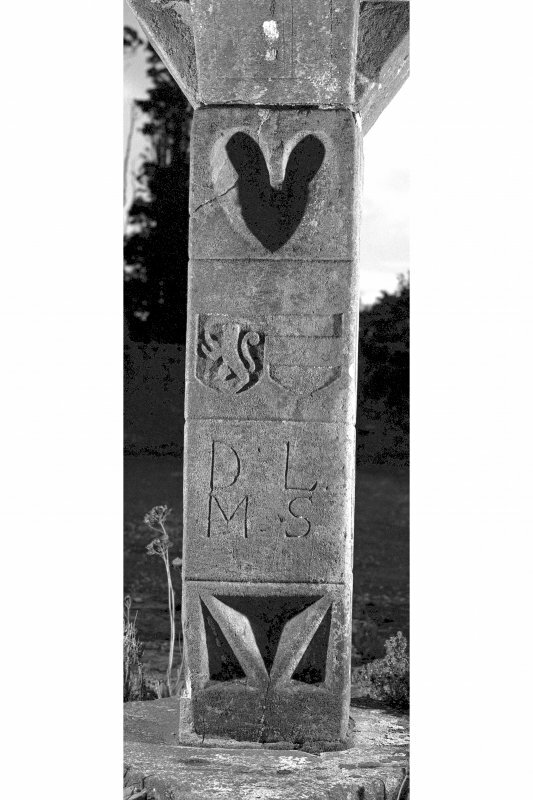 On the N face there are paired shields: dexter, a lion rampant, for Lamont; sinister, a fess (should be checky), for Stewart, above the initials DL / MS, for Dugald Lamont of Lamont, chief from 1712 to 1729, whose first wife, Margaret Stewart, married him in 1684 and died before 1723 (en.4). On the E and W faces, one panel contained a gnomon and dial. 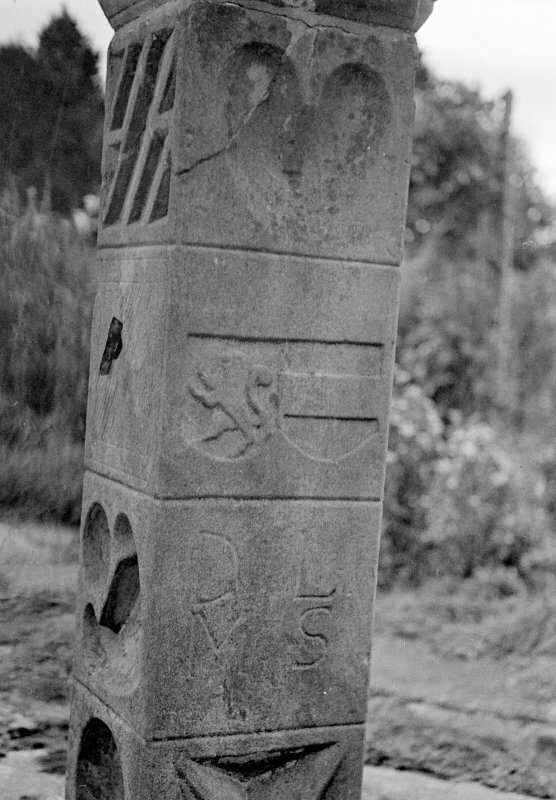 The faceted octagonal ball bears the usual sunken circles and hearts surrounding flat dials with gnomons, and the obelisk, which is less weathered than the other sections, bears three dials on each face. It carries a modern metal orrery.